A global show and series of events at ClearWater for Summer 2018! ClearWater hosts 4th Annual Portrait Paint-Off March 10, 2018! Concord, NC—On Thursday, March 1, 2018, ClearWater Artist Studios will present two Guest Artist Talks, starting at 6:30p.m., within a Closing Reception for the 2nd Annual Faculty Exhibition of the Fine & Applied Arts Department at Rowan-Cabarrus Community College (RCCC). The Exhibition opened January 19 in the Gallery at ClearWater. The Talks & Reception will be free and the Public is invited to attend. Doors open at 6:00p.m. and will close at 8p.m. The show features various artworks, in various media by nine Full-Time and Adjunct Visual Arts Faculty at RCCC. Works range from 6-foot tall watercolor close-ups of trees, to photography, photo-collage, abstract & surrealist painting and mixed media. The two artists/ faculty presenting their Artist Talks, are Anna Kenar, whose intaglio prints examining and manipulating imagery from World War II photos are on exhibit; and Mikel Frank, whose colorful abstract paintings incorporate tissue and other materials and artifacts. Ms. Kenar teaches as a full-time studio art instructor at RCCC, as well as teaching classes at Bechtler Museum of Modern Art and in the College of Art + Architecture at UNC Charlotte, NC. Kenar holds an MFA degree in Printmaking from Northern University of Illinois, DeKalb, IL. Her talk will start at 6:30p.m. running until 7:00. Mr. Frank worked 1986-2014 at the Metropolitan Museum of Art, NYC; and served as instructor, Board Member and Curator at the 1978 Maplewood Art Center in Maplewood, NJ for many years. He has an ongoing collaborative art partnership with painter and filmmaker, Gerard Amsellem, called The Visual Passion Duo which has presented a number of live painting demonstrations and collaborative art events. He holds an MFA degree in painting from Pratt Institute, Brooklyn, NY; and a BFA degree from MICA (Maryland Institute College of Art), Baltimore, MD. His talk will be 7p.m. until 7:30. ClearWater Artist Studios is the artist haven and community hub housed in the City of Concord's nearly century-old former water works and utility operations facilities. It launched a new, interactive website in September 2017. For questions, email clearwatermgr@gmail.com or connect on Facebook, @ClearwaterArtistStudios. ClearWater Artist Studios is located in Gibson Village, less than a mile from Downtown Concord, at 223 Crowell Drive NW. Its Gallery is open to the public Weds-Friday, Noon-6pm; every 2nd Saturday 10am-4pm; and/or by appointment. The Gallery, outdoor Green, and open-air covered Market are available to rent for private events. For details, see clearwaterartists.com; or call 704-784-9535. CONCORD, NC – For a brief three weeks, starting this Saturday, the public can get a view of a ‘hidden art’ in the special exhibit, “Creative Surfaces: The Art of Decorative Artisanal Walls,” on view Dec. 9-29, 2017 in the Gallery at ClearWater Artist Studios. Decorative Artisans transform mundane walls, ceilings, floors and more into custom-designed, jaw-dropping interiors –often tricking the eye into believing solid stone, hand-carved plaster, metal, or leather exists where surface applications simply dress up drywall. Those at the top of the field are hired by moguls and millionaires, to make homes, corporate spaces and places of worship look richly and uniquely appointed. Many reach a level of fine art, in their handcrafted details. Two such artisans reside here in Concord, NC and are in high demand. They’ve been in this business for 25 years as a couple, running their home-based business from their house on Union Street South; and also their studio. Bob and Cindy Andrews have created custom decorative finishes for clients all over the Southeast and the country; they run classes for others mastering the craft and materials, and rub elbows with colleagues doing castles and churches on far-away continents. Their 2nd studio is based at ClearWater Artist Studios, in the Gibson Village Neighborhood. ClearWater Artist Studios is the artist haven and community hub housed in the City of Concord's nearly century-old former water works and utility operations facilities. It launched a new, interactive website in August; feedback on the new clearwaterartists.com is welcomed. Email clearwatermgr@gmail.com or connect on Facebook, @ClearwaterArtistStudios. ClearWater Artist Studios is located in Gibson Village, less than a mile from Downtown Concord, at 223 Crowell Drive NW. Its Gallery is open to the public Weds-Friday, Noon-5pm; every 2nd Saturday 10am-4pm; and/or by appointment. The Gallery, outdoor Green, and open-air covered Market are available to rent for private events. For details, see clearwaterartists.com; or call 704-784-9535. CONCORD, NC – ClearWater Artist Studios is pleased to announce a new show, on view Oct. 7- Dec. 1, 2017. 'Abstracting Spirit: A New Direction,' is a solo exhibition of ClearWater tenant artist, Barbara Ellis' abstract expressionist paintings, which have evolved over the year 2016-17 as she delves deeper into how Spirit moves her artistic practice. The public is invited to come view the exhibit anytime during Open Hours or by appointment; group tours welcome. 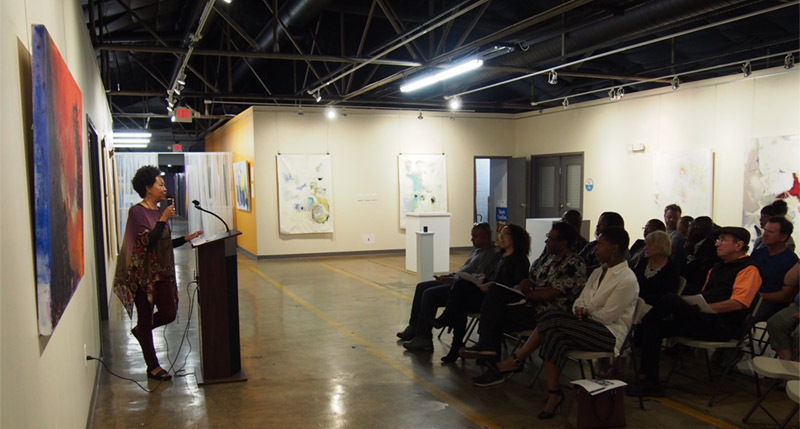 The Opening Reception, Oct. 7th, drew an appreciative audience for Ellis’s Artist Talk. Born in New York, NY, Barbara Ellis received her Bachelors of Art degree from The City College of New York, in 1978. Throughout her demanding corporate career, she found time for continuing classes in art on the side. Upon relocating to Charlotte, NC in 2004, it became obvious that the corporate path was no longer a fit. She then embarked, while still working full-time, on a creative path; over years building relationships with Charlotte artists, participating in group shows, and eventually coming to ClearWater Artist Studios, where Ellis has rented a studio since 2012. In 2015 she retired, and committed to working as an artist full-time. In 2016 she won as an ArtPop finalist, placing her artwork on a local billboard for a year. Ellis was inspired to explore Abstract Expressionism after a visit to an exhibit of Women in Abstract Expressionism at the Mint Museum of Charlotte; and after experimenting upon a large surface, using one of ClearWater Artist Studios’ “Giant Easels.” Abstract expressionists in the ‘50’s integrated the lyricism and spontaneity of Jazz music into their paintings, which resonates with her, she says, “as I grew up during the 1950’s and 60s in a family where Jazz was an integral part of its fabric.” Her great-grandfather was a well-known pianist in the New York ragtime scene. Barbara lives in Charlotte with her husband Henry, who helped her set up an audio recording of her own philosophical musings over Jazz music, as “sound-track” for the exhibit. She now happily reinvents herself daily by working her craft full-time at Clearwater Artist Studios in Concord, NC. New Website for ClearWater Artist Studios in Concord,NC launches today! ClearWater Artist Studios will celebrate a joint show of new works by tenant artists, with an Opening Reception Saturday, August 12, 2017 of “ClearWater Artists: New Works (2017)," a gallery exhibit featuring new artworks by a majority of the artists leasing studios there. At 2:00 p.m., during the monthly ‘2nd Saturday Open Studios’ (which runs 10am -4pm), artists in the show will gather in the Gallery for an ‘Artist Talk Panel,’ facilitated by Manager Sarah Gay. Join the artists to learn about why and how they do what they do -- questions welcome! Art studios, and the Southern Piedmont Woodturners' workshop will be open for perusal also. Plenty of free parking, just 5 minutes from Historic Downtown Concord, Concord, North Carolina. ClearWater Artist Studios is at 223 Crowell Dr. NW, in the Gibson Village Neighborhood of Concord, NC. More info at 704-784-9535 or www.clearwaterartists.com. The Exhibition will come down at the end of September 2017, to make way for our special October show, the 2nd annual Faculty Show of works by adjunct and tenured faculty at Rowan-Cabarrus Community College (RCCC), Department of Fine & Applied Arts. The Gallery holds official Open Hours Weds-Fri, Noon until 5pm; however, the Manager is usually onsite 11a-6p most weekdays with some exceptions. Calling ahead, to be sure the door will be open during non-official Gallery times, is recommended. Plenty of free parking, just 5 minutes from Historic Downtown Concord. ClearWater Artist Studios is at 223 Crowell Dr. NW, in the Gibson Village Neighborhood of Concord, NC. More info at 704-784-9535 or www.clearwaterartists.com and/or the ClearWater Artist Studios Facebook page. Come view Ms. Levental’s conceptual storytelling project at its World Premiere, introduced to the public in a gallery setting for the first time! Levental builds miniature, three-dimensional stage sets out of paper card stock – her default set measures 16 X 20 X 20 inches— and creates paper ‘characters’ which are placed and lit, within the set and then photographed. Stories are set and shot in sequences, or individual scenes (depending on the story); then, sequences are sewn into narratives using video. The debut exhibit, on view at ClearWater until June 30, will include two of Levental’s actual paper sets with clusters of characters arranged within them; several prints on paper mounted on the gallery walls to show the photographic transformation and sequences; and an assortment of other paper sculptures in the same vein. At the Opening Reception/ Presentation, 2:00 pm on May 13th*, we will also have a digital screen running some of Levental’s video stories. During the Opening Reception/ Presentation, the artist will make a presentation/ performance about her work. She states, “I would be honored to talk about my process and share the concept of storytelling as a healing and educational experience.” She may also run a workshop on paper design. Nelli Levental is a Charlotte-area artist, graphic designer and instructor. As an experienced Instructor teaching Graphic and Applied Design at Central Piedmont Community College (CPCC), she believes that sharing her ongoing Project will be beneficial and educational. Levental has also taught at other colleges, and worked for several years as a Senior Graphic Designer for Cirque Dreams. There, she designed everything from books, catalogs, ads, billboards, posters, and flyers to costumes and props for musical theatrical productions. This spurred her ideas for her own catharthis, using theatrical storytelling techniques with her own paper characters to process and facilitate her own healing from her various past traumas as a Russian Émigré. She says this would be the first time sharing her Project and she is very excited about that. A more detailed Artist Statement describing her process will be at the show. For the PDF of the Press Release, click here. CONCORD -- On Saturday, February 18th, ClearWater Artist Studios held their 3rd Annual ‘Sun Drop Pound Cake Portrait Paint-Off.’ The signature event, unique to the Studios, drew roughly 150 visitors to watch 13 painters work live, completing portraits from a single model in under two hours. The festive atmosphere was punctuated by artist interviews, 5-minute speed drawings of audience members, & raffle prize drawings; and augmented by the plentiful Sun Drop Pound Cake on offer. Several guests went home with prizes, a new ClearWater T-shirt or a new artwork for their walls. Brazilian Samba music filled the space. The artists, grouped around model Melissa Ritchie, worked feverishly to render her likeness, while onlookers murmured excitedly and took photos or video. The five Featured Painters, invited for their portraiture skills, didn’t disappoint, producing remarkably lifelike portraits for such a short working time. Featured Painters this year were Robin Wellner, Mark Stephenson, Gordon C. James, Barbara Ellis and Isaac Payne. Many of their fans came to see them paint. “Great people, model and cake!! I had a wonderful time, even though the clock was ticking! !” Said artist Robin Wellner, one of the five ‘Featured Painters,’ whose works are on exhibit in the ClearWater Gallery through March 31. Another artist, local painter Kevin Harris, said, "What a great space… I have wanted to paint with ClearWater's resident artists for some time now and I was not disappointed… I can't wait to do it again." In their studio, the Southern Piedmont Woodturners entertained guests with demonstrations on their lathe and a display of cigar-box guitars. Local reporter, Michael Knox served as Emcee throughout the event. ClearWater Artist Studios would like to thank the many businesses and individuals who helped make this event possible: The Concord Youth Council and other volunteers during the event; The Sweet Life bakery, 2 Gals Kitchen and Cheerwine Company for the food and drink; and our generous gift-basket prize donors: Cougar Run Winery, Southern Grace Distilleries and S&D Coffee & Tea. 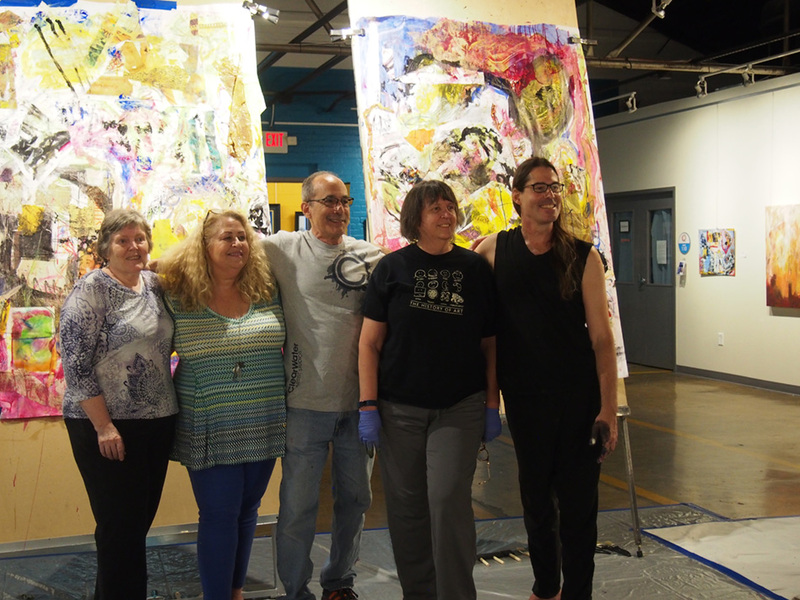 Thanks go also to the ClearWater resident artists, who kept their studios open during the event. Most especially, the painters, who participated for the fun, camaraderie and challenge of it, and allowed an audience in ‘behind the curtain’ to see their process. Next on ClearWater’s public calendar is the Opening Reception for ‘Impulse,’ the annual Student Art Exhibit of Rowan-Cabarrus Community College’s Fine Arts & Design Department, on Friday, April 7, 6-8pm. This will be the fourth year of this partnership. More events are in the works. If you’d like to be involved, the ClearWater Artists’ Coalition, an organization of the resident artists, offers Affliate Memberships to anyone interested in getting involved in planning and events, for a $25 annual dues fee. Spaces at ClearWater such as the Gallery, and outdoor green, Market etc. are available to rent for private events. Contact the Manager, Sarah Gay, to inquire. For more information, see www.clearwaterartists.com; call ClearWater Artist Studios at 704-784-9535 or send an email to: clearwatermgr@gmail.com. The ClearWater Artist Studios Facebook page is continually updated with photos. 3rd Annual Sun Drop Pound Cake Portrait Paint-Off Coming Up! CONCORD – Next Saturday, February 18, 2017, Concord’s newest art amenity, ClearWater Artist Studios, will host its 3rd Annual Sun Drop Pound Cake Portrait Paint-Off Extravaganza, in the ClearWater Artist Studios Main Gallery. All are welcome. The 3-hour, afternoon event will replicate the format it has held for two years running, which has attracted 200 or so guests each time to watch painters bring blank canvases to life, and to reimagine fine art as a spectator sport. This year the Emcee will be Concord and Kannapolis reporter and impresario, Michael Knox, reporter for the Independent Tribune. Refreshments on hand will include fluffy, glazed Sun Drop Pound Cakes (freshly baked by The Sweet Life bakery in Concord), homemade chips and salsa (courtesy of 2 Gals Kitchen in Concord) and Sun Drop soda. Art studios throughout the building will be open with resident artists present, and the Southern Piedmont Woodturners Association, a tenant and member of ClearWater Artist Studios, will hold turning demonstrations in their studio throughout the 3-hour event. This year’s ‘Featured Painters’ are Robin Wellner , Gordon C. James, Barbara Ellis, Mark Stephenson, and Isaac Payne . Additional space is granted to local painters wishing to paint from the ‘2nd row,’ on a 1st-come/ 1st served, email-reservation basis. The painters will have just two hours to complete their portrait of model Melissa Ritchie, with breaks every 20 minutes. The Emcee calls time, and entertains in his own fashion. Details and continual updates, with photos, are provided on the Facebook Event Page for this event, which can be found at www.facebook.com/ClearwaterArtistStudios/. Additionally there is an Eventbrite.com page for this event at which guests can register. ClearWater Artist Studios hopes the public will attend this free, family-friendly and colorful event designed to stimulate the senses and combine painting, open studios, and woodturning. Free parking is available in several lots around the ClearWater campus. LOCATION: ClearWater Artist Studios, a community development project of the City of Concord at its former water treatment and Electrical Operations buildings; now artist studios/gallery still in development: 223 Crowell Drive NW, 28025. For more information contact: Sarah Gay, Manager of ClearWater Artist Studios for the City of Concord; 704-784-9535 or clearwatermgr@gmail.com. Spaces at ClearWater are available to rent for private events. This joint show juxtaposes the different styles of four artists: Regina Calton Burchett, ClearWater Resident artist (pastels + oil); Debbie Rasberry (pastels); Carmella Jarvi (glass); and Chris Craft (encaustics). In turn, their fresh, contemporary work itself contrasts with the setting, a sprawling, former industrial building in the heart of Concord, near the Historic Downtown. These artists, whose work all explores different elemental relationships between form and color, the eye and the hand, perception and expression, and the elements of Nature, come together with their very different styles in a joint celebration of Earth, Wind & Fire. The show will fill the 2,000+ sq-ft Main Gallery in ClearWater Artist Studios. The Opening Reception, Friday January 13, 2017 from 6-8:30pm, will feature all four artists, with refreshments, music, and discussion, along with an artist demonstration and talk by Chris Craft, encaustic painter, at 7pm during the reception. Additional Artist Demonstrations will be held the following day, Saturday January 14, during Second Saturday Open Studios at ClearWater, which runs 10am – 4pm (featuring other resident artists with studios open, plus a woodturning club). Regina Burchett’s pastel demo and talk will be at Noon; and Carmella Jarvi will give a glass demo and talk at 2pm. ClearWater’s Gallery is open to the public Weds-Friday Noon-5pm; every 2nd Saturday 10am-4pm; or by appointment. The ClearWater Gallery, outdoor Green, and open-air covered Market are available to rent out for private events and parties.